It�s cold over here on the East Coast and I, personally, enjoy the opportunity to layer and create a little bit more expression out of my wardrobe. So much can be done with the combinations of hats, shoes, coats and scarves that I find that winter is one of the few times I feel that I don�t repeat looks. The key to all of this variation is to have a solid foundation in your closet- and the most apparent article of clothing is your coat, so make sure it�s a versatile one. But what coat style is best when settling in for the season? There is the obvious option of keeping three or more coats- a casual, a dressed-up, and a formal. That is a costly option, to be sure. I think, however, that a proper overcoat can take care of at least two, if not all, of the styles. The nice thing about overcoats is that they largely conceal your outfit. Usually ending at about knee height, they take care of the uniformity of the outfit and its total formality of appearance. You could wear a casual hoodie and jeans, but still look presentable on the street. Likewise, they are usually fitted to be worn over suits or sports coats, so they also can be presented in a formal setting and blend in perfectly. It�s true that because of the quality and quantity of materials, overcoats can be rather expensive. But since it can take the place of many of other coats, those saved costs should be kept in consideration- also, you do very often get what you pay for. 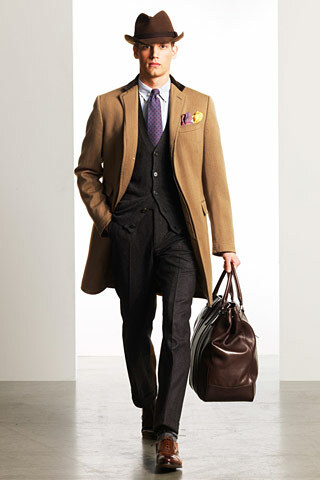 There are a myriad of overcoat styles: the Chesterfield (my favorite,) the Polo, the Trench, the Paletot, the Covert, etc. All of these carry nuance of cut and detail that are definitely worth exploring, and prior to purchasing should be tried overtop of a suit or sports coat to make sure that the cut will not bunch upon buttoning. Once you have made your selection, you will likely find yourself unwilling to step foot in the cold without it. Overcoats are a staple and timeless style, and can quickly become your wardrobe�s best friend.  Archived in Mens Fashion and tagged Fall 2013 Trends, fall fashion, men's coats, mens fashion, overcoats, versatility, winter fashion. Bookmark the permalink.